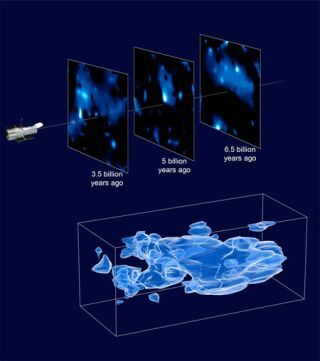 Researchers created a 3D map of dark matter in a large portion of the universe by combining gravitational lensing data from more than half a million galaxies scattered across a range of distances from Earth. The three axes of the box (bottom) correspond to sky position, and distance from Earth, increasing from left to right. The search for elusive dark matter is still drawing a blank,according to new results from one of the most powerful experiments currently huntingfor the invisible stuff. The XENON100 experiment buried deep underground in Italy isone of a handful of efforts to directly detectdark matter, a substance thought to be plentiful in the universe, despitethe fact that our telescopes can't see it. Astronomers can detect dark matter'sgravitational effects on normal matter, but have not yet confirmed a directmeasurement of the sought-after substance. While a few teams have reported potentialsightings of the strange stuff, the new results from XENON100 ? which itsscientists say is the most sensitive search to date ? suggests those possiblesignals were not dark matter. If they were, XENON100 should have detected dozensof events unless the properties of dark matter are very different thanexpected. "Dark matter particles continue to escape ourinstruments, yet we are getting much more clever in our search and feelconfident that we will soon unveil them," said Elena Aprile, spokespersonof the XENON100 experiment and a professor of physics at Columbia University. XENON100 is a stainless steel container filled withultra-pure liquid xenon nestled between two very sensitive cameras. If a darkmatter particle hits this detector, the cameras should record a signal. The project is buried beneath 5,000 feet (1,520 meters) ofrock in Italy's Gran Sasso Underground Laboratory in a chamber of lead andcopper that, along with the rock, helps filter out other radiation, includingcosmic rays from space, that could be mistaken for dark matter. The researchers use the element xenon because it is one ofthe heaviest atoms in the periodic table; at three times the density of water,it has many atoms per liter, which maximizes the chance that a dark matterparticle will collide with it and produce a signal. One of the leading candidates for dark matter's secretidentity is something called a Weakly Interacting Massive Particle, or WIMP. "Liquid xenon is a precious and wonderful material forcatching and studying WIMPS," Aprile said. In 1997, the DAMA/LIBRA research group of the University ofRome Tor Vergata became one of the first to claim it had found dark matter.This past February, the CoGeNT collaboration led by the University of Chicagoannounced that it, too, had found a signal indicative of dark matter. However, the new results from XENON100 cast doubt on both ofthese findings, researchers say. The scientists presented their findings at adark matter workshop on May 1 and have submitted a paper to the journal PhysicalReview Letters. You Decide: What's the Greatest Mystery in Science?